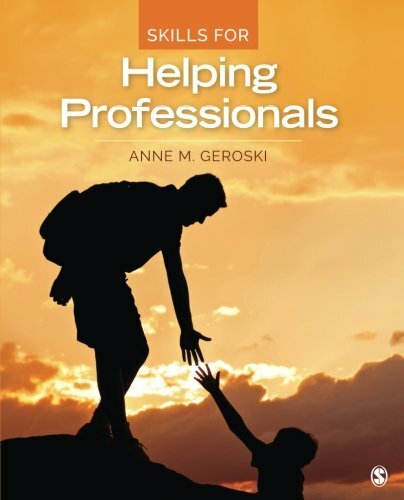 Amazon.com description: Product Description: Written specifically for non-clinical undergraduate students, but also relevant to graduate studies in helping professions, Skills for Helping Professionals, by Anne M. Geroski focuses on helping students develop the skills they need to effectively initiate and maintain helping relationships. After exploring the literature identifying critical components of helping relationships and briefly reviewing developmental and helping theories, the text covers such topics as the helping process, self-awareness, and ethics in helping, and then focuses on specific helping skills such as listening and hearing, empathy, reflecting, paraphrasing, questioning, clarifying, exploring, and offering feedback, encouragement, and psycho-education. The final chapters focus on individuals in crisis and helping in groups. About: Written specifically for non-clinical undergraduate students, but also relevant to graduate studies in helping professions, Skills for Helping Professionals, by Anne M.